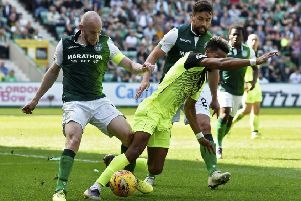 “I’ve never played in a team where you do not miss quality,” replied Hibs boss Alan Stubbs when asked in the wake of defeat by Falkirk if the absence of top-scorer Dominque Malonga had been a factor in the ending of his side’s eight-match unbeaten run in the Championship. Malonga, the Congo internationalist, suspended after being sent off in the dying minutes of the Scottish Cup win over Alloa Athletic seven days earlier, may have been the subject of that particular question, but could just as easily have included Farid El Alagui, Dylan McGeouch, Jordon Forster and club skipper Liam Craig, who all sat out the clash with the Bairns because of injury. Other clubs have, of course, dealt with the loss of five key players but Saturday, perhaps, highlighted just how stretched Stubbs’ squad can become when so many experienced pros are missing at the one time, two of the places on the bench being taken by teenagers Lewis Allan and Scott Martin, both of whom went on to make their first-team debuts – albeit that the latter enjoying only a couple of minutes following Falkirk defender David McCracken’s late winner for the home side. Stubbs, as he revealed to the Evening News, hopes to bring in as many as four new signings in the January transfer window to complement the nine who arrived during the summer when he had to put a squad together hastily having taken over from the sacked Terry Butcher to find 14 players had been released following relegation – a number that rose to 16 as Ryan McGivern and Michael Nelson also headed for the exit door. The return of striker El Alagui, who ruptured his Achilles tendon in August, Forster, the victim of a broken foot, and McGeouch, who required surgery for an ankle injury, will of course increase Stubbs’ options in the longer term, while both Malonga and Craig will be available for the visit of Alloa this weekend. But while missing five players who would be widely regarded by Hibs fans as first picks could be used as a ready-made excuse for defeat, midfielder Sam Stanton, who started his first match since September 20, was having none of it, adamant the 11 chosen by Stubbs were good enough to have earned the Capital club a seventh consecutive away win. Stanton, who had scored a hat-trick for the Under-20s a few days earlier Partick Thistle U20s, was naturally happy enough to be given the nod, having been restricted to a few minutes here and there as he had stepped off the bench over the course of the previous two months – although he’d scored in the 6-3 win over Dumbarton. But he had the smile taken off his face by the final scoreline. “It was nice to get a start,” said the 20-year-old midfielder. “But to lose the game, and particularly in the last minute, makes it bitterly disappointing. We’d set out to get the three points, but we just weren’t good enough right from the beginning of the game. “We would have been disappointed with a point before the match, but the way things went a draw would have been better than nothing. Having notched 19 goals in their previous six away matches Hibs were restricted to no more than a couple of half-chances against Falkirk, Stanton himself seeing one shot look set to nestle in the corner of goalkeeper Jamie MacDonald’s net until it took a slight deflection off a Bairns defender minutes before the interval. And likewise, Paul Heffernan, another brought in from the cold to make his first start since mid-September, thought he’d broken the deadlock, the striker pouncing after MacDonald could only push Danny Handling’s powerfully-struck cross into his path, the Irishman left holding his head in disbelief as Luke Leahy took the ball off his own goal-line. Hibs not only passed up the chance to haul themselves level with Queen of the South after James Fowler’s side were well beaten by Championship leaders Hearts, but the opportunity to widen the gap on Falkirk, Raith Rovers and Dumbarton – the three sides immediately below them in the table – with MacDonald admitting victory had re-ignited Falkirk’s hopes of overhauling the Edinburgh club to claim a play-off place of their own.